Blue Origin, the space company founded by Amazon billionaire Jeff Bezos, conducted a successful launch and landing of its New Shepard rocket and crew capsule on Wednesday. Why it matters: The launch and landing bring the company closer to flying humans to suborbital space, which it hopes to begin by the end of 2019. In addition to space tourism, the company is also vying with Elon Musk's SpaceX — as well as a host of other private sector firms — to win contracts to carry cargo payloads to space. Details: The New Shepard rocket carried a crew capsule with 8 NASA science experiments to a maximum height of 350,775 feet over Blue Origin's West Texas launch site. This is just past the typically recognized boundary between where the Earth's atmosphere ends and space begins. At this altitude, the crew capsule experienced a microgravity environment — useful to some of the scientific payloads aboard, including one to measure the cooling of closely packed electronics during spaceflight. 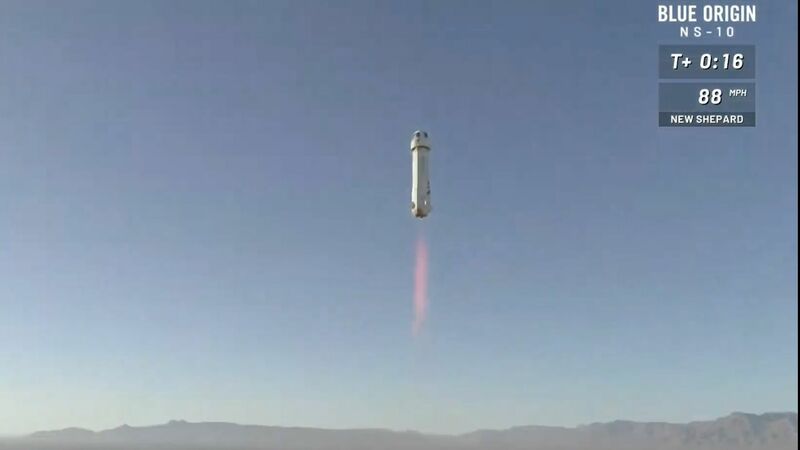 Both the rocket and the capsule successfully returned to Earth for landings. The recovery of the rocket and the capsule is significant, since reusing rockets is a major way for companies like Blue Origin to lower the cost of access to space. This was the 4th time this particular New Shepard rocket has been to space and back. Between the lines: Notably, the test flight was broadcast live online. Historically, the company has been known for its secrecy — and, for a time, it did not announce test flights in advance. The livestream put it in line with its rivals, chiefly SpaceX.